One of the criteria for the habitability of exoplanets is their obliquity—the angle of the axis relative to the orbit around a star. Current thinking holds that the more extreme the tilt, the less likely the possibility of life. But MIT researchers suggest one notable exception: a world completely covered by water. Typically speaking, an Earth-like planet tilted horizontally, like a spinning rotisserie, would not be prime extraterrestrial real estate. As it revolves around its star, the north pole would experience daylight continuously for six months, and then darkness for six months. Such a world would alternately boil and freeze, presenting a very unfriendly environment for life. However, David Ferreira, who led a research team at MIT's Department of Earth, Atmospheric and Planetary Sciences, developed a computer simulation that, he says, found that a planet-sized ocean would store heat during the summer and then release it in winter, so "the climate is still pretty mild, even in the heart of the cold polar night." 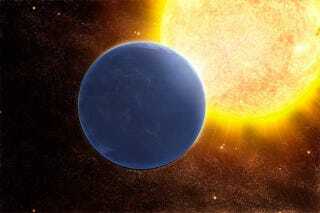 When searching for habitable exoplanets, he adds, "don't discount high-obliquity ones as unsuitable for life." Ferreira and his colleagues used a model developed at MIT to simulate a high-obliquity "aquaplanet" — an Earth-sized planet, at a similar distance from its sun, covered entirely in water. The three-dimensional model is designed to simulate circulations among the atmosphere, ocean, and sea ice, taking into the account the effects of winds and heat in driving a 3000-meter deep ocean. For comparison, the researchers also coupled the atmospheric model with simplified, motionless "swamp" oceans of various depths: 200 meters, 50 meters, and 10 meters. "We were expecting that if you put an ocean on the planet, it might be a bit more habitable, but not to this point," Ferreira says. "It's really surprising that the temperatures at the poles are still habitable." Among the exoplanets discovered thus far, there are one or two terrestrial-sized worlds out of a thousand that appear to have densities comparable to water. As such, says Darren Williams, a professor of physics and astronomy at Pennsylvania State University, "the probability of an all-water planet is at least 0.1 percent."